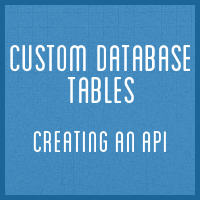 In the first part of this series we looked at the disadvantages of using a custom table. One of the major ones is the lack of an API: so in this article we’ll look at how to create one. The API acts a layer between handling data in your plug-in and the actual interaction with the database table – and is primarily intended to ensure such interactions are safe and to provide a ‘human friendly’ wrapper for your table. As such we’ll require wrapper functions for inserting, updating, deleting and querying data.